FDA Application Fee The Federal Food, Drug, and Cosmetic Act, as amended by the Prescription Drug User Fee Amendments of 2012, which was signed by the President on July 9, 2012 (PDUFA V), authorizes FDA to collect user fees for certain applications for approval of drug and biological products. This document establishes fee rates for fiscal year (FY) 2013 for application fees for an application requiring clinical data ($1,958,800), for establishment fees ($526,500), and for product fees ($98,380). These fees are effective on October 1, 2012, and will remain in effect through September 30, 2013. For applications submitted on or after October 1, 2012, the new fee schedule must be used. Drug / product U.S. Food and Drug Administration, 2012c. Number of IRB Amendments Average number of amendments for a given therapeutic area and phase, as derived from Getz, et al., 2011. 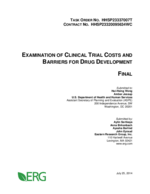 In this study, amendments were defined as “any change to a protocol requiring internal approval followed by approval from the IRB, ethical review board (ERB), or regulatory authority. Only implemented amendments—that is, amendments approved both internally and by the ethics committee—were counted and analyzed in this study.” Per-phase amendment counts were calculated by multiplying the average number of amendments by phase (from Table 3 in Getz, et al., 2011) by a therapeutic area-specific factor (calculated using numbers in Table 4 in Getz, et al., 2011). Study Getz, et al., 2011; calculation. Success Probability The percent chance that a trial will be successful in a given phase and progress to the next phase (or, in the case of the NDA/BLA review phase, the percent chance that the drug will be granted approval). The BioMedTracker success probabilities used represent ERG's best guess for most relevant therapeutic area; if figures were not available for a similar therapeutic area, general/overall percentages were used. Custom success probabilities may be entered as decimals between 0 and 1 with leading zero (e.g., 0.80). Only one success probability value may be specified for the entire set of trials within a given phase. Percent per phase Hay et al., 2011. Worldwide Sales Revenues (millions of 2008 dollars) Worldwide sales revenues (in millions of dollars) over the product life cycle for new drugs approved in the United States during the period from 1990 to 1994 (net present values, discounted at 11% to the launch year). The revenue figures have been inflated from 2000 dollars to 2008 dollars (midpoint between 2004 and 2012, the range covered by the itemized cost data) using the producer price index for commodities in the category “Drugs and pharmaceuticals” from the Bureau of Labor Statistics (BLS). Drug / product (millions of 2008 dollars) DiMasi, Grabowski, & Vernon, 2004; Consumer Price Index (CPI) Inflation Calculator. (2012). [a] Phase 1 study sites tend to have in-house or local labs as opposed to central labs.